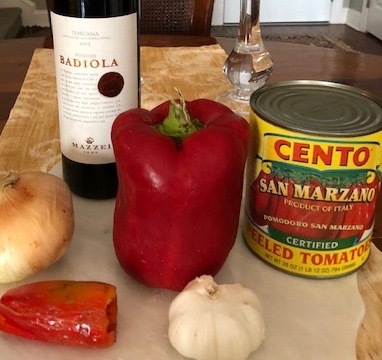 It’s almost Columbus Day and in a tribute to that intrepid (if flawed) explorer, and to all things Italian, I will share with you a simple, but exquisite, recipe for making the perfect marinara sauce. But first, let’s take a candid look at Christopher Columbus. Columbus spent most of his adult life trying (unsuccessfully) to convince the Italian government to underwrite a voyage to India where he promised to procure all manner of exotic spices. Undaunted, Columbus then went to Portugal where he lobbied King Ferdinand and Queen Isabella. He pestered the king and queen so relentlessly that they finally gave in, secretly hoping that he, along with the Nina, Pinta and Santa Maria, would sail out of their lives and off the end of the world – which, of course, was flat back then. You have to give it to Columbus, though. He was persistent and ultimately successful. But you also have to admit he was directionally challenged. Here’s a guy who traveled west to find a quicker route to the east and ended up discovering north…. AMERICA? But thanks to Columbus, my Italian grandparents also took the voyage from Europe to America, and I exist because of them – and him. I have a multitude of wonderful memories of my Italian-American family, and of growing up in the North View section of Clarksburg. One of my most cherished and enduring recollections, though, is of my Grandma in her kitchen, lovingly making her delectable marinara sauce. The recipe below is a close approximation of her simple, yet delicious, creation. One quick note about wine pairings with pasta marinara: You don’t necessarily need to use Italian wine. Any medium to full-bodied red will marry nicely with the spicy tomato sauce featured below. Here are two wines – one from Italy and one from France, you might consider. 2015 Domaine Lafage Bastide Miraflors Rouge ($17) – Composed of 70% syrah and 30% old vine grenache, this southern French red has loads of ripe blueberry and blackberry flavors. It is also spicy and a perfect match to the flavors in the marinara. 2014 Castello Di Albola Chianti Classico Riserva ($22) –This medium-bodied red has scents of new oak, and is an elegant and ripe sangiovese-based wine. Paired with Grandma’s marinara, the combination is truly simpatico.